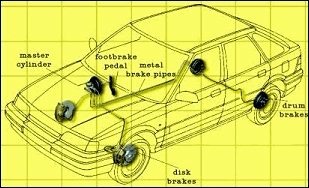 How do brakes stop a car? When you step on your brake pedal, hydraulic pressure is created in the master cylinder located within the engine compartment. The cylinder is filled with brake fluid which is pressurised along a series of brake pipes and hoses to the hydraulically activated pistons in each wheel's hub assembly that force the friction material on your pads or shoes on to rotating parts, causing your car to stop. 80% of the braking force in a car goes through the front wheels. 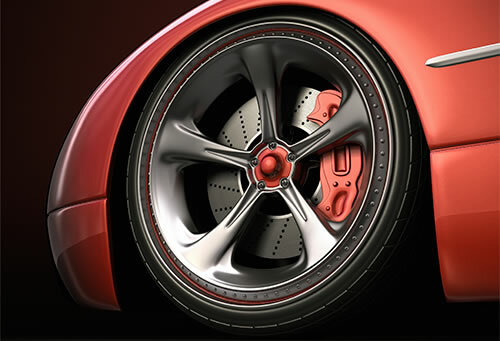 One of two systems is attached to the wheel area of a car – a disc brake or a drum brake. Disc brakes are usually fitted to the front wheels though on high performance or larger vehicles they may also be fitted to the rear. The disc brake is similar to the brakes on a bicycle. Bicycle brakes have a caliper, which squeezes the brake pads against the wheel. In a disc brake, the brake pads squeeze the disc instead of the wheel, and the force is transmitted hydraulically instead of through a cable. Friction between the pads and the disc slows the disc down enabling the vehicle to slow down or stop. Drum brakes work on the same principle as disc brakes i.e. shoes press against a spinning surface. In this system, that surface is called a drum. When you step on your brake pedal the two curved brake shoes, which have a friction material lining, are forced by hydraulic wheel cylinders against the inner surface of a rotating brake drum. This contact produces friction causing the drum and the wheel to slow down or stop. ABS (anti-locking braking system) is designed to stop car wheels locking during heavy braking which can lead to skidding and loss of control. With normal brakes, the brake pads exert pressure upon the wheels, causing them to rotate more slowly. This slows the car down whilst the continuing rotation allows the car to turn under control. This is because when the front wheels turn, as they continue to rotate they pull the front of the car in the desired direction. The problem is that if one of more wheels start to rotate at different speeds to the rest (when turning the wheels need to rotate at slightly different speeds otherwise the car wouldn't turn) the wheels begin to lock. This can result in one or more of the wheels stopping rotating and just skidding along the ground. If you then turn whilst the wheels are sliding (and not turning) they cannot pull the front of the car around and you will skid forwards in a straight line. The car may begin to turn but continue to move in the original direction causing the car to face one way but move in another. The ABS system monitors the speed of rotation of all the wheels and if it senses one turning at the wrong speed it can reduce or increase the brake pad pressure to allow that wheel to retain a similar speed to the rest, allowing the car to turn smoothly. The ABS system does this repeatedly when braking so you may feel a sort of pulse when this occurs. For your braking system to work effectively there must be fluid in the hydraulic pipes. If the fluid starts to leak from the system the brake pedal will feel 'softer' and will often travel further when pressed. If your brake pedal feels soft or 'spongy' stop as soon as it is safe to do so and get a breakdown mechanic to check the car. If the pedal feels soft, you might be able to build up brake pressure by repeatedly pumping it,however, this is only to stop the car... and is not a 'get you home' solution. A shuddering sensation or grinding noise when you apply the brakes means that your brake pads may be excessively worn. If you need to stop suddenly use the handbrake in an on-off pumping motion. If there's time, change to second gear and bring the clutch up gently (the engine compression will make the clutch feel like a brake) then use the handbrake to stop. You must have a straight run of space in which to stop; this is because your power steering will fail as soon as the engine is switched off - it may be almost impossible to turn the wheel. A second danger is that the steering lock could engage; in some models this can happen even if the key is still in the ignition switch. It is reassuring to note that most late model cars have 'dual circuit' brakes which will still work on at least two wheels in the event of system failure. Brake fade refers to a situation where the brakes lose efficiency (or possibly fail completely). It is extremely rare in modern, well maintained vehicles. There are two causes of brake fade. The most common is caused by overheated brake pads. This is almost unheard of with modern brake technology - you would need to brake long and hard down a (very, very) long hill. When the brakes cool down they work OK again. The second cause is water in the brake fluid. When the fluid gets hot the water can vaporise. Steam (unlike brake fluid) will compress - therefore instead of your braking effort being transmitted to the wheels, it is dissipated as the steam compresses. When the system cools down the brakes will seem OK again. If your car is regularly serviced, the brake fluid will be replaced periodically and this problem should not occur. If your handbrake fails, leave the car in first or reverse gear (or Park) when you park and chock your front wheels against the kerb. It is not wise to leave your car on a hill, even with the wheels chocked. There are two checks that you can make. Static and rolling. The static brake test involves pressing the brake pedal when you get into the car. There should be resistance from the pedal; if there isn't you have probably got a fluid leak and should not drive the car. The rolling brake test is done by pressing the brake pedal gently as soon as possible after moving off and while driving slowly. This will reassure you that your brakes are OK before you need them. However, it's always better to have your brakes checked by an expert. At National our highly qualified technicians can perform a visual examination of the pads, discs, hoses, pipes and callipers to ensure there are no obvious defects. Please note that for an in-depth check including shoes, drums, cylinders and brake fluid, an additional charge will be made for this service due to the additional time involved. This charge will be agreed with you in advance of the work being carried out. ABS light on. Possible ABS sensor defect. Obtain specialist advice immediately. Brake pedal 'sinks' slowly while braking. The brake fluid in the system has absorbed to much water – fluid leak. Unusual noises on braking. Lining material worn or disc or drum glazed. Vehicle pulls to one side. Calliper or wheel cylinder sticking or hydraulic seal leaking. Brake pedal pulsates up and down. Disc or drum warped. Rear wheels lock and skid. Over adjusted rear brakes. Defective regulating valve. Low, soft and spongy pedal. Air trapped in hydraulic system or loss of brake fluid. Friction material worn to replacement stage. Rear brakes out of adjustment. Hard pedal. Extended stopping distance. Brake servo inoperative. Vibration of steering wheel. High-spot on disc or drum or defective or improperly adjusted wheel bearings. Warped disc. Wheels hard to turn. Brake pads or shoes not releasing. Calliper not releasing. Fluid on backing plate. Leaking brake pipe or loose connection. Leaking wheel hydraulic cylinder or leaking hose. Cracks in brake hose or fluid leakage. Perished or corroded hose cover or pipes. Scored disc / drum. Critically worn brake pads or discs. Low fluid level in master cylinder. Leak in hydraulic system. Warm road wheel. Brake calliper not releasing, brakes over adjusted. Binding brakes. If you spot any of the above symptoms, have your vehicle checked at National Tyres and Autocare. If you have any doubts about the performance of your brakes, our highly skilled technicians at National can carry out a visual inspection completely FREE OF CHARGE. This includes checking your brake pads, brake discs and brake pipes. To book your free brake check online click on the link below and follow the simple steps. Alternatively call your nearest branch on 0808 115 5517. Please note that due to the additional time required to check the shoes, drums, cylinders and brake fluid, an additional charge will be made for this service. This charge will be agreed with you in advance of the work being carried out. EBC performance brakes are available through our performance motoring website n-tech which offers exhausts and brakes for performance vehicles from reputable manufacturers.